For beautiful floral display and refreshing greenery, every yard needs a combination of annual bedding plants, perennials and shrubs. 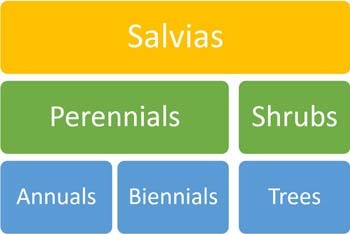 Salvias provide a feast of landscaping possibilities. Plus, many Salvias are a literal feast for small wildlife, such as bees, butterflies and hummingbirds. These landscaping components abound colorfully worldwide among Salvias offering choices ranging from full sun to full shade plants. Only trees are a rarity in the massive Salvia genus, which contains about 1000 true sages -- many in multiple varieties as well as hybrids -- in the mint family (Lamiaceae). We'll explore the choices, starting at annuals and rising up into the not-to-tall canopy of some sages referred to as trees. Somewhere all sages are repeat performers fitting into the category of perennial or shrub. However, many grow so rapidly and provide such a long-lasting floral display that gardeners in USDA zones with chilly winters grow them as annuals requiring planting each year. Long blooming, heavily flowered Friendship Sage (S. 'Amistad') is one of many examples. Many Salvia annuals, such as Tropical Sage (S. coccinea) are also referred to as tender perennials due to succumbing to light frost, which can even occur in warm winter USDA zones 10 and 11. Herbaceous perennials have soft stems as well as foliage. They don't have woody growth unless they are in the somewhat ambiguous category called subshrubs, which have both soft and woody growth. Most perennial Salvia species die to ground during winter. In contrast, the woody portion of subshrubs often remains standing during the cold months. Some soft herbaceous species, such as Hummingbird Sage (S. spathacea) are evergreen unless an unexpected frost hits their warm zones. Perennials return in spring year after year in their USDA hardiness zones. Hardy Salvia perennials range from shade- and water-loving Japanese woodland sages to Central Asian species, such as Turkish Salvias, that tolerate heat, cold and drought. Except in warm native environments, most Salvia subshrubs are deciduous, which means that they lose their foliage in winter. However, some are evergreen in their warmer USDA zones, such as the Autumn Sage and Mountain Sage group (S. greggii and S. microphylla), which are known for greenery year round in the warmest areas of Texas and the Southwest. In contrast, cold-hardy varieties of these species are deciduous in cold-winter zones and may lose their foliage if an unexpected freeze strikes in a warm winter zone. Salvias that have almost entirely woody stems are called shrubs. If grown in areas with winter lows and other growing conditions similar to their home environments, they are generally evergreen. Evergreen Salvia shrubs include the heat- and drought-tolerant Cleveland Sages (Salvia clevelandii), which are native to central and southern California where their coldest environment is Zone 8. If freezing temperatures occur and, especially, if prolonged, these evergreen shrubs may lose some or all of their foliage. Some Salvia shrubs are so tall, woody, leafy and long-lived that they are referred to as trees. However, as the University of Utah notes "the distinction between trees and shrubs is not always clear." One Salvia species that is considered arboreal in its homeland of the Dominican Republic is Sage Tree (S. arborescens), which can grow up to 12 feet tall and 5 feet wide in USDA Plant Hardiness Zones 9 to 11. Another species that some Salvia specialists classify as a tree and others see as a shrub is Big Mexican Scarlet Sage (S. gesneriiflora 'Tequila') which grows up to 10 feet tall and spreads about eight feet wide in Zones 8 to 11. Yes, some Salvias, such as Silver Sage (S. argentea), are biennial. Biennials are plants that put their effort into producing foliage their first year and then bloom in subsequent years. Flowers by the Sea grows hundreds of Salvia species and companion plants, which we sell through our online plant nursery. Please feel free to contact FBTS about whatever kind you want or that piques your curiosity. We're here to help you get started creating a more beautiful garden.